Positive Promotions is your one-stop shop for affordable nursing gifts that reward and motivate everyone on your nursing staff. Celebrate National Nurses Week in style by displaying our attention-getting poster and buttons, or make your event planning easy and economical with our all-inclusive Celebration Pack. You’ll also find a wide variety of gifts for nurses featuring exclusive recognition themes and designs, with many beautifully packaged and ready for presentation. And don’t miss special combo nurse gifts and Raffle Packs that offer multiple popular products in one money-saving item. You'll also discover practical, customized nursing gifts featuring your name, logo, or message, sure to increase brand awareness as you honor those special members of your nursing team. 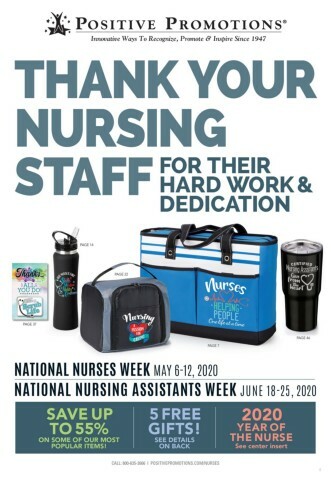 From lunch bags and water bottles to totes and portable phone chargers, each time nurses use these practical recognition gifts, they will be reminded how truly invaluable they are to their patients, their fellow nurses, and your facility. With something for every need and every budget, you can count on Positive Promotions to help make your events successful. We look forward to working with you during National Nurses Week events, and all year long!